USDA farm raised, grain-fed Beef, Chicken, and Venison Sea Mobility treats are Wheat-Free, Corn-Free, and Soy-Free! Sea Mobility is a delicious, nutritious and healthy choice for active dogs, performance/agility, working/service dogs, and field/hunting dogs as a treat, reward, or training and behavioral aid. Also excellent for dogs that can’t swallow pills or capsules. 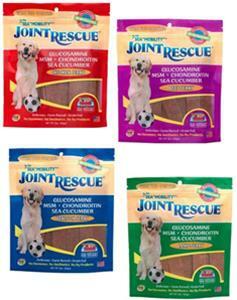 I got the chicken flavor, and my dogs love it, they also get their daily dose of glucosamine with this treat.